Guyetts Funerals in Warrnambool offers a range of Australian-made coffins and caskets. The selection is available to view at Eastern Park, and our friendly funeral directors are happy to help you make your selection. An environmental option. Flat lid of plantation pine finished in a clear beeswax polish. All joins are sealed with beeswax. Unbleached calico lining. Rosewood finish in wood grain veneer. Solid timber bar handles and grooved sides. The single raised lid features a routed cross. White satin interior. Sold timber, rounded corner, fluted side and ends in a walnut finish. White satin interior. Matching wood bar handles. Double raised lid, beautifully hand polished solid cedar with matching wooden bar handles. The natural grain and routed side panels, together with contoured mouldings and highest quality interior, create a quality product. 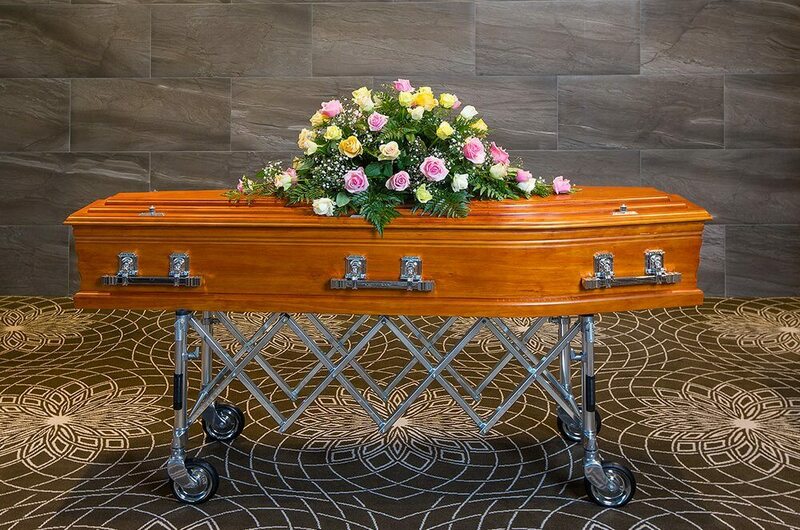 A quality solid timber casket with moulded sides and matching wooden bar handles. A richly rucked interior and finished in rosewood, hand polished to perfection. Wood grain veneer, white satin interior, single raised lid in rosewood. White lacquer finish, veneer style, single raised lid. Silver fittings and a white satin interior. Maple finish in wood grain veneer, grooved sides, single raised lid. Silver plated plastic handles. White satin interior. Solid blackwood casket with classic urn design with matching timber bar handles. Copper coloured fittings with a quality champagne satin lining. Solid timber with a double raised lid, hand polished in a light teak finish. Carved ends with quality mouldings. Interior is a white satin lining with ruffled trim lace. Flat lid, woodgrain veneer coffin in maple. Plisse interior with silver plated plastic handles.